I know this hop is supposed to be wordless but, just quickly, Bella has recuperated from last Wednesday's procedure nicely. Her limp has largely abated but we're starting to see signs of it again. Ever so slight and only every so often. Still hopeful though so keep your paws crossed if you would. Thanks. For those wondering how we're doing with Bella's limp, she is in Boston today having her shoulder joint aspirated and a steroid injected. We just got news that she is out of surgery and resting comfortably. Now we wait to find out if it worked. For the record, it's chicken dehydrating on the counter that has her so captivated. We will give an update when we have one. Thanks for stopping by and be sure to check out the rest of the blogs in today's Wordless Wednesday blog hop! Hey guys, a quick Follow-up Friday here on a Saturday night. As you can see, I've done little to improve my time management skills and am still playing a bit of catch up. Isn't Frodo cute? If you were paying attention this week, you might have picked up on the fact that he's not the first Frodo in the family but more on that in a moment. I was very excited to meet Frodo having talked to my sister through their whole adoption experience. Frodo sounded just like the dog for them and, while every new dog needs some adjustment time and Frodo is no exception, he's also a very happy, friendly dog who defers to the cats in the family and seems to just love everyone. I enjoyed playing with him and he apparently liked me a little bit, too. I got slathered with kisses, he sat in my lap and later in the day began with ear slobbers and nose nibbles. He was playing with me. And I was hooked. However that meeting will be delayed for a while yet due to Bella's current state of health. More on that in a moment. 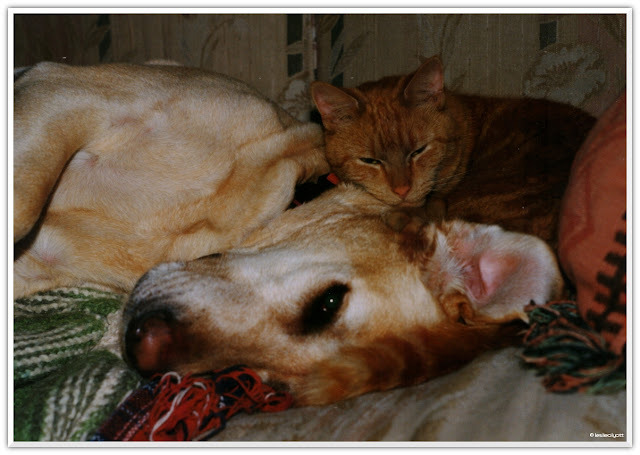 Wordless Wednesday 83 - A Beau and his cat. Aren't they cute? Beau and Frodo were a real interesting pair. They played rough together, slept together, and when I took Beau for walks, Frodo traveled right along with us just a few meters behind. I miss them both. Is it Kosher to follow up on a Follow-up? Well, I need to so here goes anyway... Bella had her appointment with the neurologist at Angell Animal Medical Center and we have a diagnosis and a treatment plan. She has what is the equivalent of a torn rotator cuff. We are weighing our options under the advice of doctors, trainers and friends. We will keep you posted. Additionally, we have recently learned that Bella likely has Colitis. Poor little pumpkin just can't catch a break. On the bright side, she obviously feels rather sorry for herself and is looking for comfort in the form of hugs and snuggles. We are happy to oblige. So that's all the news that fit to print right now. Monday I hope to pick up the story of Bella's agility and training adventures again. In the meantime, thanks for all the positive thoughts and good wishes. If you're interested in keeping up with Bella in real time, I give more frequent updates on her Facebook page if you want to follow her there. Thanks a bunch for dropping by. 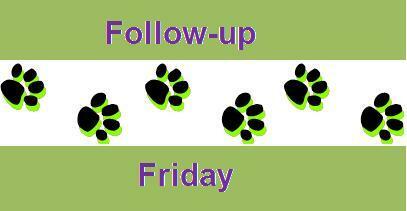 And thank you, Jodi from Heart Like a Dog and this week's co-host, Two Brown Dawgs for letting us join in the Follow-up Friday blog hop. Here's an old favorite picture of mine of my beautiful Beau and his cat, Frodo. They were inseparable. The new dog nephew, that is. Ah, there he is. Everybody, meet Frodo. I was very excited to meet my new nephew for the first time today. Frodo was rescued from the Warwick Animal Shelter in RI by my sister and her family. He is very sweet. Anyway, on to some follow up and then I want to take a moment to talk about some blog-keeping notes. "Black & White Sunday: Let me in..." had a lot of people wondering why Bella, apparently already inside, wanted to be let in and in where? This picture was taken Christmas morning and Bella wanted to be let in to the room with her presents. (Which is actually the basement.) Sorry about that. Going back just a little further to a week ago Wednesday's post "A little nervous", this was actually a fairly recent picture taken just in January of this year in her agility class. As far as Bella has come, she still gets nervous sometimes but is learning more and more to look to us for assurance. I will undoubtedly wish Beau a happy birthday every year. I spent a third of my life with him and his presence left an indelible mark on me. But don't worry or feel bad, I no longer dread the day. Although I won't commemorate the day of his passing, his birthday has become a day of appreciation. 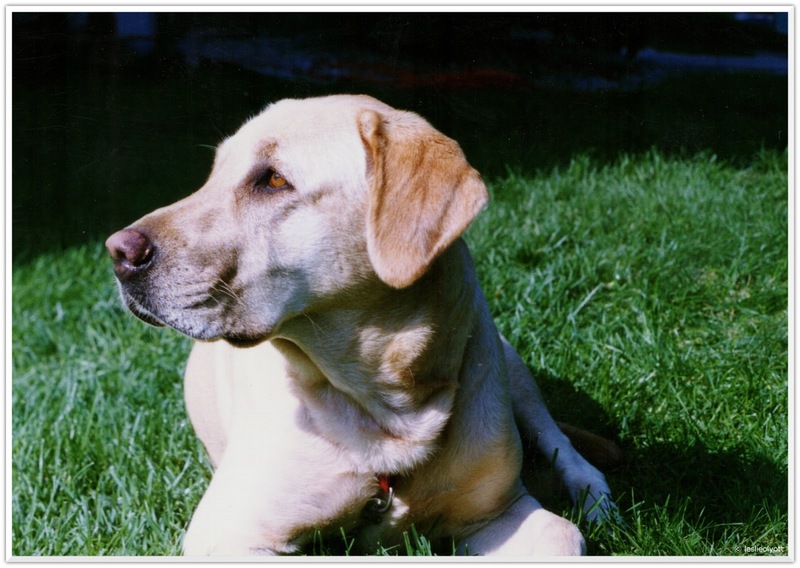 Beau was A Good Dog. First, allow me to apologize for not keeping up with everyone. I miss you all and look forward to maybe having some time this weekend to do catch up. Second, allow me to apologize even more profusely for doing such a crappy job at recognizing the kind folks who've presented us with awards over the last several months. I swear I had a post written to get me back in to the groove and my PC shut down on me crushing all my pride and enthusiasm that I was finally getting "a round tuit". Finally, allow me to apologize for letting Bella's agility story wane a bit. I know the next chapter, I just need time to write it. My job is simply out of control. I can't say much more than that but I'll be lucky to have time to breathe over the next 3 months. If I live through the experience, one would hope it will make my life easier going forward. Jan, being retired, has decided this is the perfect time to begin work on finishing the ceiling in our master bedroom. Fair enough, I've been whining mildly about the lack of such for some time. However, it demands some of my time and attention at times or, at the very least, creates an interesting ambiance what with the scaffolding and air compressor hanging about. At the same time, our master bath shower decided to crumble and we've spent the last several weeks at glass and fixture stores, talking to plumbers, and fighting over designing the tile layout for a new one. And let's just say I find myself regularly considering a change in profession as my mind boggles over the estimates people keep delivering to us with a straight face. Really, if you've never been through it, it an incredibly eye-opening experience. Finally, there's the reason you all are here: our beautiful Bella. Bella is still doing well in her agility class and her behavior modification program continues as well. However, since September 2012, she has been limping and doctor after doctor hasn't been able to figure out what's wrong or offer her much relief. She has been going to rehab (details on that forthcoming) and been through a number of vet exams, x-rays and ultra-sounds. It is frustrating and heart-breaking that we haven't been able to ease her pain and on top of it, she can't run and play because we don't know the impact doing such would have on whatever is wrong with her. She is still our little darling and has been a plucky little soldier through the whole thing but it's discouraging and sapping my energy in ways I never imagined. Over the last few weeks, she's started having tummy issues (diarrhea, a bit of lethargy, and even a morning barf-fest) and we were back at the vet again today. We're trying a special, limited diet and pro-biotics for now but will probably have to cancel her rehab and agility class if she can't have her special "go-to" treats that help her get through those scary events. I don't mean to whine. I know this is what life is. But with Bella, just going to the vet is a traumatic adventure and requires careful planning and preparation. It's also unspeakably heart-breaking to know that, despite all we've done to allay her imaginary fears, when push comes to shove, we can't protect her from real danger. On the bright side, she has an appointment with a neurologist at Angell Animal Medical Center in Boston on Tuesday. The doctor we are seeing has been presented as something of a miracle worker by absolutely everyone we have spoken to so our hopes are high for some sort of resolution or at least a path to progress. We will keep you posted. In the meantime, I ask for your patience and forgiveness. Bella is the reason I started the blog and right now she takes priority over it. But I do miss you all. 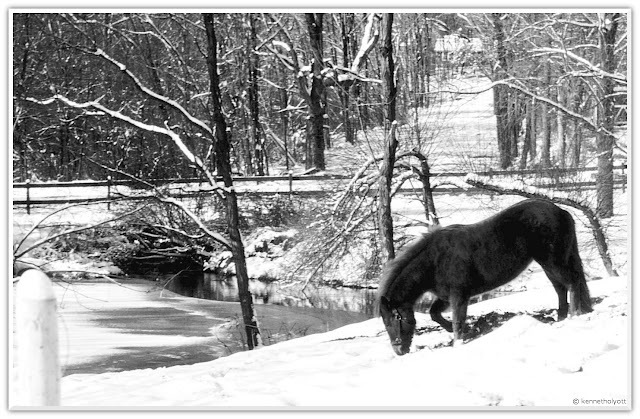 (Not quite) Wordless Wednesday 82 - "On the day that you were born..."
Beau would have been 19 years old tomorrow. Instead he has been gone from us for 5. Still miss you, buddy. Happy birthday. Lest you think life with Bella has been all unicorns and rainbows since we started her on the 5-pronged approach recommended by Dr. Dodman including medications and her Agility for Reactive Dogs class in the Fall of 2011, life just never really seems to go in a particularly straight line. Even while we were making progress training Bella over the various agility obstacles, and she was taking her prescribed medications, eating a low(er) protein diet and getting as much exercise as we could work into our schedule, in January/February 2012, Bella started showing signs of increased anxiety at home again. She began darting from the room at the slightest sound, not sleeping through the night and becoming even more frantic about storms and unexpected events. First, Bella and Jan had another scuffle in February. I called Dr. D.s' office immediately but it would be April before we could get back in to see him for a follow-up. Then, a week or so later, we learned how quickly things can turn south in a classroom full of reactive dogs. 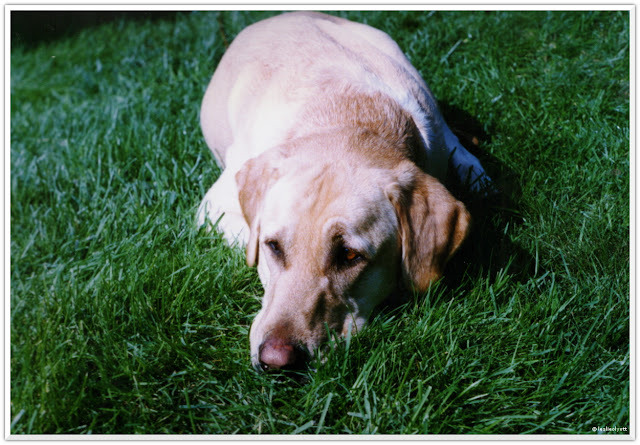 In the early days of class, our trainer, Carolyn, would have us walk the dogs around the room in a parade route fashion - each dog staying appropriately distanced behind the next to keep them under threshold. The idea was for the person following to be responsible for maintaining the distance behind the dog in front. But sometimes the dogs have other ideas. Bella had been toodling right along in class for a couple of months when one night, while she was stalled admiring the alluring aroma of classmate Elmo's mat, classmate Willie decided to trot his way over the dog walk heading straight towards Bella at a pretty good and noisy clip. I, sadly without eyes in the back of my head, was watching Elmo in front of us and missed the signals Bella was most certainly sending me before she blew up like a mad dog in Willie's direction behind me. Hrumph. Landing solidly on one of my knees and following that with my face, the best I could do was hold on (and pray I hadn't just broken my knee). Bella continued to lunge and growl at the end of the leash and Willie gave his owner a good tussle mimicking Bella's behavior back at her. It took a moment for everyone to realize I wasn't able to get up and suddenly Jan and Carolyn sprang between the dogs - Jan getting Bella back under control and Carolyn helping Willie's owner handle him and herd him back to his mat. Sweet little Elmo remained rather oblivious to the whole encounter as he was now on the opposite side of the room. Still not quite calm but getting better. The trick that salvaged this situation was the the double leashes we use on the dogs in class and Carolyn's requirement that we wrap the loop end of both around our wrists. In my case, I often push the loop up over my elbow since my hands are small and I worry that the loops will slip over and out of my hand. The mark of a good teacher, in my mind, is the ability to read a situation, understand the needs and motivations of her students and change her teaching methods if and when they're not working for any individual. Carolyn is a very good teacher. And she has made several modifications to her approach in teaching us and helping our dogs over the life of our class. After Bella's little outburst, Carolyn stopped having us walk around together in a circle and had us all line up along the same wall. Baby gates and sheets separating the dogs so they couldn't see each other at all except during controlled warm-up periods. Over time, as the dogs got better at that, we started working them on some of the obstacles during the warm-up sessions, first one dog at a time, then two and finally the whole class working together at the same time. Bonding over treats and training. So while we waited to get in to see Dr. D and get his recommendations for Bella's continuing anxiety, it was a great relief to be able to rely on Carolyn's experience and advice on how to keep working on Bella's reactivity and improve her relationship with Jan through the classes. Jan and I learned we need to take turns as Bella's handler each week. Improving Jan's relationship with her is our highest priority but at the same time, we can't have mine suffer as a result. We could end up having the same problem but just reversing to whom it's directed. Everyone has a role to play in helping Bella heal and we each have to be a part of the solution if this is going to work. Thank you, daddy, for teaching me. Jan and Bella's relationship has improved over time and with a great deal of effort and patience. I am fortunate to have married the most amazing man in the world, one who clearly never gives up on those he loves. Bella surely is one lucky girl.